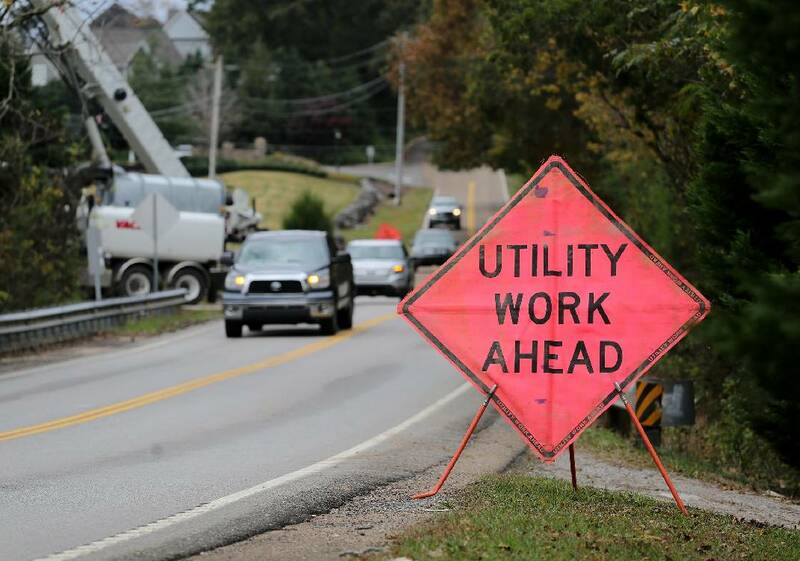 A sign indicates work being done along in the 7600 block of Snow Hill Road on Nov. 2 in Ooltewah. The Water and Wastewater Treatment Authority workers were clearing a stand pipe at the Snow Hill pump station. The state of Tennessee is signing off on a $1.56 million loan that will help Hamilton County's sewer authority check for leaks in its system. It's a small but important part of some $200 million in repairs and rehabilitation the Water and Wastewater Treatment Authority is planning to stop overflows that dump raw sewage into creeks and streams feeding the Tennessee River. The WWTA is expecting early this year to sign a legal agreement, called a consent decree, mandating that it perform the repairs to comply with the federal Clean Water Act. The U.S. Department of Justice, the Environmental Protection Agency, Tennessee's attorney general and environmental regulators will monitor the authority's work. The $200 million rehabilitation plan does not include a $45 million sewage treatment plant the authority had hoped to build in the Mahan Gap Road area. Hamilton County commissioners voted in 2017 to raise property taxes, in part to finance bonds for the treatment plant. But in the face of vehement and organized opposition from area homeowners, commissioners gave a thumbs-down to the proposed site in December. WWTA now is looking for another site. To perform the sewer line assessment, contractors will peer into cameras and set off smoke bombs in 184,000 linear feet of sewer lines and inspect 975 manholes serving the unincorporated county and WWTA member towns Signal Mountain, Red Bank, East Ridge and Lookout Mountain, Tennessee. The sanitary sewer system, from the sinks and toilets in your house to the wastewater treatment plant, is supposed to be sealed. Cracks and breaks let rainwater infiltrate the lines, and the overloads spill unprocessed waste into the environment. WWTA Executive Director Mark Harrison said Friday the $1.56 million from the Clean Water State Revolving Loan Fund will reimburse the authority for the work. Planning for this and other pieces of the larger rehabilitation goal is taking place alongside the consent decree negotiations, Harrison said. "We didn't wait until the consent decree was signed before we started doing the assessment, design and rehab work," he said. Harrison said the camera and manhole inspections must be done during wet weather, so those could start as soon as a contractor is selected. Smoke tests, which involve sealing the ends of a section of sewer line, setting off a smoke bomb inside, and monitoring where the smoke escapes through breaks or cracks, must be done in the dry season. He said homeowners might find the tests a little unnerving, as they'll see smoke — harmless and odorless, but unexpected — coming out of their bathroom fixtures. Harrison said WWTA will use everything from advertising to notifying local police and fire departments to door hangers to let residents know when smoke testing is planned. The assessment will take six months to a year, and about the same for planning how to fix the leaks. Actual repairs, which could range from relining manholes and sewer lines to replacing force mains and building storage tanks, are a year or two off, he said. Also Friday, Harrison took issue with what he said is a misleading Facebook post claiming WWTA workers handled a diesel spill at the Snow Hill pump station by sweeping the spilled fuel into Rogers Branch. A video posted on the No Ooltewah Sewage Plant page showed a worker sweeping liquid with a broom, and still photos of a rainbow-colored sheen across the driveway leading to the pump station. "This is how the WWTA cleans constant diesel spills from the Snowhill Pump Station directly next to a creek and a neighborhood golf course into an area they have already posted as contaminated," the post states. Harrison said there was a spill when a worker overfilled a tank that fuels pumps on site, but the crew used containment booms and absorbent materials to collect and remove the fuel. He said the video actually was shot in November and showed a WWTA worker cleaning up at the site. Facebook user Rick Weller posted on the No Ooltewah Sewage Plant page that he'd sent the images to the Tennessee Department of Environment and Conservation. On Friday afternoon, a TDEC spokeswoman told the Times Free Press in an email: "TDEC has been in contact with the WWTA and visited the site regarding this complaint. Some staining on the ground was observed that appeared to be where a piece of equipment had been replaced and oil drying materials had been applied. It is our understanding that spill kits will now be kept on site." Weller could not be reached for comment Friday afternoon.